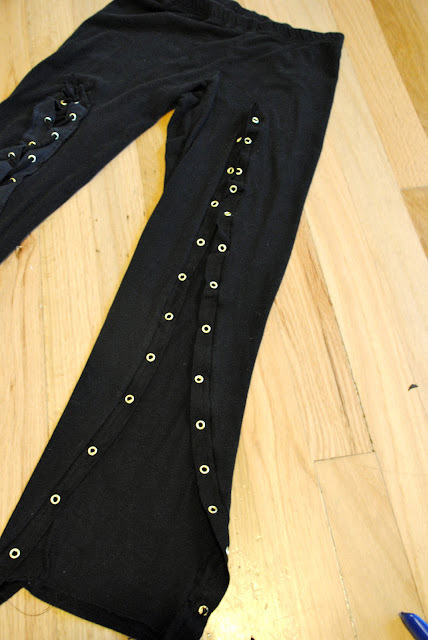 Trash To Couture: DIY Edgy grommet leggings. 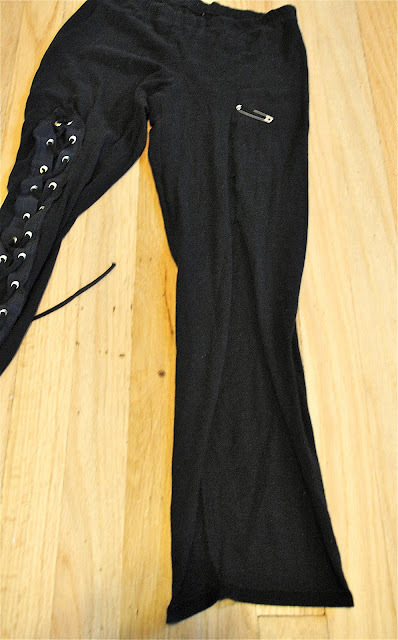 Try the leggings on and place a safety pin where you want the slit to go (don't go too high). For me I wear longer tops with leggings so about mid thigh is good. Then cut down the middle of the leggings to that point (just the front side). You can do this on the side seams of the leggings too...I prefer the side seam but did the front to be more dramatic for the pictures. You can even just grommet to the knee...ect. Fold over a strip of 2" fabric and press in half (right sides out). Then use the Dritz Eyelet Pliers or 2-Part Eyelet Tools to apply the eyelets. I did mine 1.5" apart. Mark with tailors chalk or marking tool to keep them even. Both work great...If you have a baby sleeping like me, I do the Eyelet Pliers, if you don't I do the 2-Part Eyelet Tools. Go to the links above for full instructions on how to use them. They even include video tutorials for each product. You can also fold the cut edges over 1/4" and then place the eyelets in. This is the easiest but if your leggings are really small it might be a problem. Although the lace up portion should give you some extra room depending on how loose you tie them up. Another option would be to purchase the pre-made grommet trim at the fabric store (look in the trim section). Pin the whole trim all the way around with ends at the bottom. I did right sides together but you can top stitch too. I would measure first before going to the fabric store to make sure how much you need. 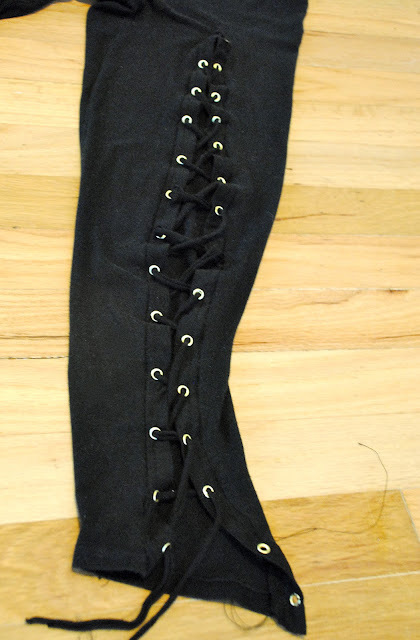 I'm sewing the eyelet trim I created right sides together along the raw edge of the leggings. If you have trim pre-made you can top stitch it along the interior part of the leggings. It should look like this when done. Now lace up string starting at the top. Make sure to get a long string at least 2 yards. ..I had to re-lace 4 times because the string was too short. These are meant to be fun and edgy...that's what fashion is all about! this is so HOT! i def want to try this. I love your instagram!!! Where did you get the whole trim from? I can only find the eyelets that you put in one at a time and its being a pain! i found it at the fabric store by all the ribbons, etc. not by where they have the individual grommets and the punch and all that. I don't know how your store is set up though, obviously. Try looking there! i made these today and i LOVE them! thanks for the tutorial! Ahhh! Love this and I'm totally going to try it; thank you! I love it, will definitely have to give it a try and also I love the boots! What are they? These look so freaken hot!. Awesome job! I made them and they're all the rage! wow..that's so cool!! and by the way..the sweater is cool too ;o) where is it from? what store did you buy the grommet trim at?I can only find the single ones. . . I know these are actually meant for wearing as a statement piece, but these would be seriously awesome pants for a rocker / pirate Halloween costume. I LOVE the top you're wearing in these pictures. Where did you get it? Can;t wait to make these leggings...definitely doing the front. Didn't the leggings curl when you cut them? How do you prevent this? What kind of leggings did you use? Higher end ones from a clothing store or cheap ones like from Wal mart? Yes. I would definitely follow you on tumblr or subscribe to you on youtube. That shirt is super cute too. Can i buy a pair if you make them? You ought to be a part of a contest for one of the best blogs online. I'm going to recommend this site! You wrote it very well, it is very nice to read this.